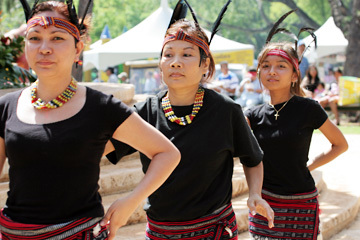 The "Benguet Ifugao Banawe Apayao Kalingga" dance group will perform at the Filipino Fiesta Saturday at Kapiolani Park. The group consists of mountain people from the Philippines. The Filipino Fiesta and Parade has become a source of pride and a recognition of heritage to founder Eddie Flores, current organizer Bryan Andaya and other members of the Filipino-American community. When Flores started the event in 1993, he envisioned a simple, backyard-style party, made a little more visible than most shindigs with such guests as Roland Cazimero. Though the party grew a little the second year, when the parade was added, the goal was still simple. In Flores' words: "We Filipinos like to have parties. We also like parades. If we have a party, we have to have a parade." This year, 20,000 "guests" are expected to join the humble celebration, the 14th Annual Hawaiian Telcom Filipino Fiesta and Parade, which takes as its theme "Celebrating the Filipino Centennial -- 100 Years and Beyond." The entertainment list includes Willie Revillame, host of the Philippine Network Channel's "Wowowee! "; Broadway performer Kristian Lei; and singer Jasmine Trias. Plus, there's the first charity walk for the Filipino Community Center in Waipahu, to be held before the parade. Trias will be grand marshal of the parade, then sing at Kapiolani Park. "I've been to some celebrations before," said Trias, "but I've never been a part of something like this. I wanted to be involved in the Filipino Centennial Celebration. It's a big deal for all of us." "It's a great opportunity to connect to your roots," said Andaya. The baton passed from Flores to Andaya, an attorney, five years ago. The budget, once very small, is now $40,000. "What you see on the outside is a great celebration," said Andaya. "But there are financial challenges -- securing permits, securing police, getting motivated volunteers ..."
"In the old days you didn't have to pay for anything," said Flores. "Now there's operating costs, permits ..."
Flores, founder and CEO of L&L Drive-Inn, says the event hasn't lost its sense of fun, although it has grown to showcase all the regions of the Philippines, with displays of culture visible in the popular dance exhibitions, the food and the village exhibits. Flores admits that the diverse cultural heritage of the Philippines, where more than 100 languages are spoken, can make it hard to gather people for a common purpose. "Everyone is kind of strangers," said Flores. "This brings them all in together." "This is the common experience of everyone who is of Filipino descent," said Andaya. "The fiesta and parade draw all the regions together and unite us as one. Each region will be represented through food, costumes and traditional clothing." For Andaya, it awakens an interest in his roots. "Every year there's some sense of renewed touch that's not felt the rest of the year." For Trias, it is a time to stand up for her heritage. "It's great to be able to represent the Filipino community." For Flores, it is a chance to reach out. "I would love to see all the people from Hawaii come and join in, enjoy the centennial, enjoy the culture and be our friends."